In November 2016, I joined a team of passionate animal experts at the first and only wildlife sanctuary in Laos. Volunteering in Laos was a dream come true for me, as not only is this a beautiful country, but there is a lot of work to do in improving animal welfare practices here. The wildlife sanctuary is truly an inspiration, and volunteering in Laos was all I could have hoped it would be. The sanctuary is home to over 600 animals that are being cared for by a team of workers and volunteers. Many of the animals here have been kept in basic and difficult conditions for over a decade, and the volunteer project is all about improving their living conditions and subsequently their lives. On my first day at the sanctuary I had the full tour of the property. It was a whirlwind tour seeing some amazing animals – jackals, elephant, porcupine, gibbons, macaques, sun bear, Asiatic black bear, loris, snakes, deer, crocodiles, otters, turtles – just to mention a few! The site was enormous and it was amazing to see so many animals and learn about their backgrounds. The most exciting part of the tour however, was to learn all about the futures of these animals. Many of the animals here have been living in cramped conditions for over a decade, and the plans for new enclosures are quite frankly inspiring. The thing that I love is that the volunteers will actively be participating in these changes – both financially and physically. No matter how long you spend on this project, you will see the contribution that you make to the animals here first-hand. During my time volunteering here, I learned a lot. 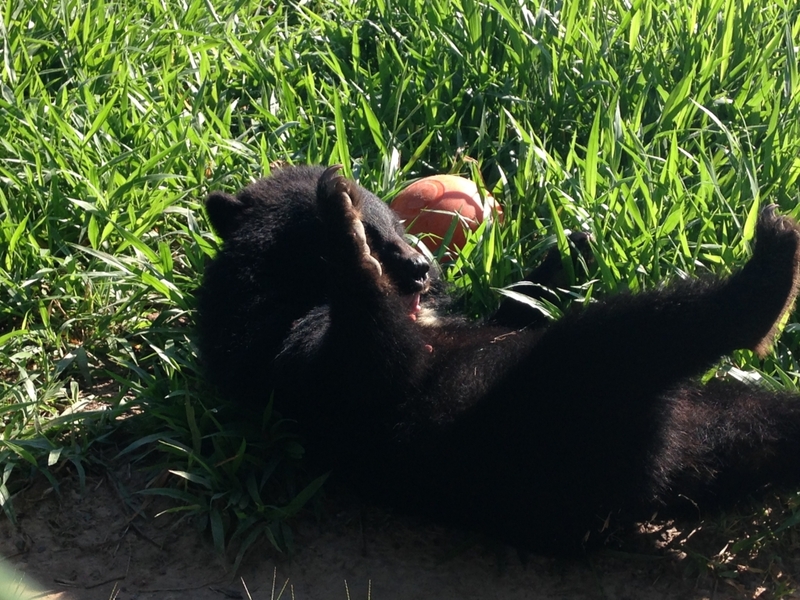 I was able to help prepare enrichments for a wide variety of animals and then watch them enjoy them. This could include putting food inside cartons, containers and dog toys – we would then give these enrichments to the animals and watch them work out how to access the food. This could take a while, and would often cause us great laughter at their antics, especially the bears as they rolled around on the floor with the enrichments. I also helped to provide much simpler enrichments, such as putting leaves in enclosures (the animals love to burrow and play in the leaves, just as children do) and hiding food in interesting places (the animals will then work hard to access it). Not all jobs were so glamorous though, and I became very well acquainted with clearing up poo and scrubbing enclosures. I was also able to enjoy some of the construction tasks. I must admit that I don’t come from an overly practical background, but I was taught exactly what to do, and after several hours I had been part of a team to create a monkey climbing frame from tyres. We were all so proud as we looked at what we had achieved, especially once it was erected in the enclosure and the primates were leaping in the tyres left, right and centre. During the evenings we got up to all sorts of great activities. One evening we lit a campfire and toasted marsh mellows, all singing along to songs that had been invented during the day. On another evening we went to the local night market, seeing all sorts of beautiful fresh fruits and vegetables, but also less desireable things such as dead squirrels and rats for sale! On another evening we had a movie night, tucked up under our duvets around a laptop and munching on snacks from the local shop. 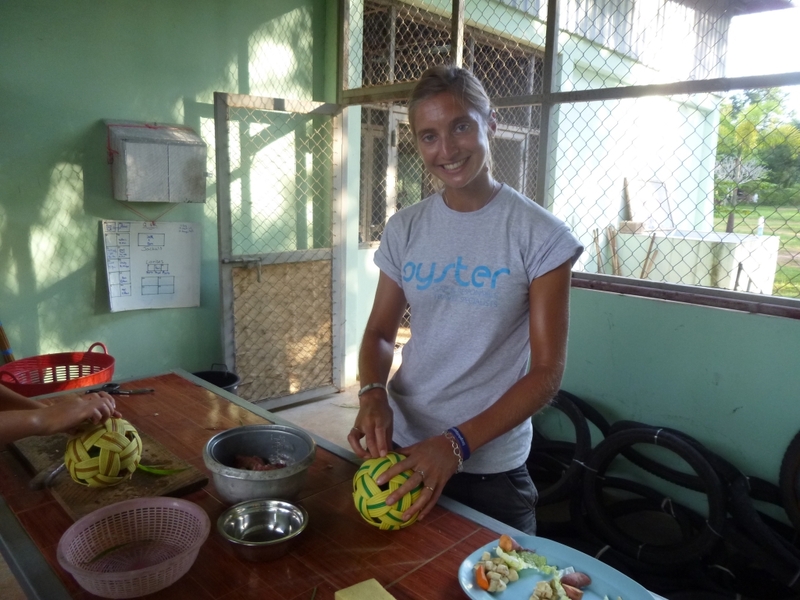 Visit the Oyster website about volunteering in Laos on this fantastic project. Yes we are very pleased to announce the launch of our Laos programmes, I have send you some further information with lots of details.